The evening is perfect for a stroll around the old quarter of Perpignan, the central city of Catalonia in France. Catalonia, which spans the eastern end of the Pyrenees from Perpignan south to Barcelona in Spain, has a strong ethnic identity based on its rich cultural heritage, proud history, and common language, Catalan. I can see, about a block ahead, café tables crowded together into a semicircle under their bright blue umbrellas. They form the curved side of a large, open plaza. Along its straight side runs the high wall of a grumpy old fortress called the Castillet. Against this ancient stone building, a temporary platform has been set up with two rows of chairs on it. As I arrive in the plaza I pass a wooden sign hanging on the wall of the Castillet: “Sardane ce soir 20:00h.” – tonight they’re going to dance the sardana, the traditional folk dance of Catalonia, here at eight o’clock. A crowd has already started to gather and a couple of men are sitting up on the platform holding trumpets. I smile at my good luck – I’ve arrived just in time. Suddenly, floodlights pour a golden glow onto the Castillet and the sense of expectation grows as people begin to line the edges of the plaza. Twenty musicians in white open-necked shirts and black pants or skirts begin warming up. There are clarinet-like woodwinds, trumpets, a bass violin, and a piccolo. The band launches into a pleasant, lively folk melody. Everyone listens appreciatively. A young woman, obviously the leader of the musicians, sets the tempo on a tiny drum the size and shape of a rolled-up newspaper. Another warm-up tune is followed by a minute or two of rest. Then the leader gives three smart whacks on her drum: tock! tock! tock! The musicians begin a leisurely, lilting air that is different from the first two. A few people leave their café tables and walk slowly out into the empty center of the cobblestone plaza. A couple from a different table joins them, and then another, until there are about twenty people holding hands in a circle. 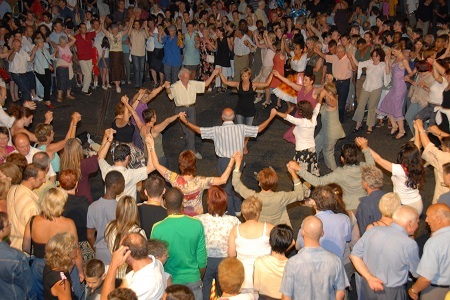 They start dancing the sardana, with hands held motionless at shoulder height, each dancer clasping the hand of the person on either side, men alternating with women. The circle doesn’t rotate – everyone stays in place as their feet weave what seems to me an intricate set of steps. There are young people in the circle, but they’re far outnumbered by those in their fifties and older. The tempo is very slow and relaxed. Then the beat starts to increase and the dancers’ light feet begin speeding up to keep pace until the final crescendo when the dance comes to a sudden end. Everyone applauds as the dancers drift slowly back to their coffee cups and wine glasses. The musicians play another folk tune and then pause for a short rest. Tock! tock! tock! The leader’s drum starts the band off again in a slow, swinging sardana gait. This time a few dozen people leave their chairs and come out into the plaza, spontaneously forming three circles, then four. Each group join hands to make a motionless wreath of arms and shoulders that bobs slightly while feet draw deft, noiseless patterns on the paving stones. All at once, I imagine the four circles becoming one big one. Chinese people in subdued gray outfits are pouring out of the side streets to join the dance, along with Nigerian women in bright-colored head-wraps. The circle starts getting larger and larger as South Americans with faces like Inca carvings stream onto the plaza to join with little children from Iraq and Israel, all holding hands in the one big sardana. I jump up from my table and join the dance with my brothers and sisters in this single enormous sardana. My eyes fill with tears: I am holding hands with the whole world! A voice from inside says to me, “Yes! This is the way it could be. The way it would be if we were to let the Lord lead the dance.” Then, to my amazement, my parents and grandparents who died years ago are there, too, hands held elegantly, their feet effortlessly going through the steps. The pace increases, and feet tap faster and faster. The ground itself is vibrating with the rhythm. This is the final crescendo. Suddenly I’m back in reality. Everyone is applauding, and the dancers are returning once more to their coffee cups and wine glasses. The cobblestones are empty as the band strikes up another interlude. It’s time for me to leave to catch the midnight train for Rome. I stand and start off, alone once again, on the one-mile walk to the station. With a light sardana bounce to my step I begin to reflect on what I’ve just experienced. An ancient monastic tradition holds that the monastery foreshadows the Kingdom of Heaven by the way the monks live together in unity, with no one seeking his own will, no one competing with another, but each trying to help his brother. Well, even in the holiest monastery we still have a long way to go. And so does the rest of the world. But every now and then we catch a little glimpse of the General Dance. Every time someone acts like a brother or sister to someone else, the world draws a step closer to its goal of unity. A little white child walks to school holding hands with her African American classmate. The Christians in a certain town put Chanukah lights in their windows as a sign of solidarity with a Jewish family victimized by anti-Semitic vandalism. Two warring factions in some troubled country agree to stop fighting and open peace negotiations. Each of these is a preview of what is surely going to happen one day sooner or later. On that day, the Lord of the Dance, Jesus himself, will appear seated on a throne in shining majesty and will invite all the peoples of the world to join hands as sisters and brothers. One great circle of humanity will stretch across the entire globe and reach upward toward the stars of Heaven. The Lord will stand up, and the whole universe will fall silent, holding its breath in expectation. Then he will give the signal to start the General Dance – three smart raps on a little drum: tock! tock! tock! The image of the crucified Jesus leading the dance suggests that his suffering gives meaning to our own pain and affliction, making them part of a mysterious pattern, part of the dance. Think of a time when the crucified Savior has asked you to follow him in the dance by sharing his pain and suffering. What was your response to his invitation? During this Holy Week ask Jesus to help you respond more willingly to his call as Lord of the Dance.